Crazy 4 Challenges 48-It's a Sketch! 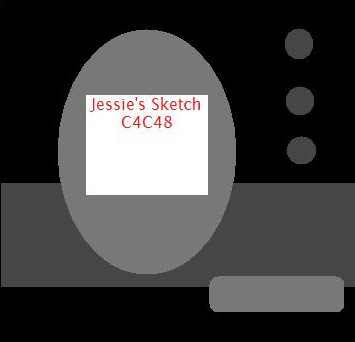 This week, our ever so talented Jessie, has designed a fabulous sketch for us to play with! If you would like to play along with us, all you have to do is create a card/project, and upload it to your blog and/or to your SCS Gallery using the keyword C4C48. Don't forget to come back here and link it on Mr Linky so that everyone else can see it too. 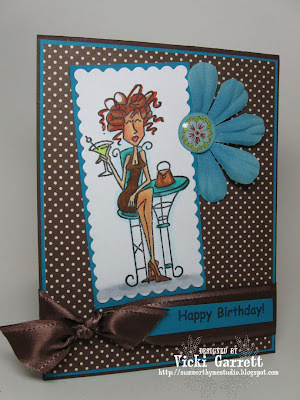 Stampotique Designer's Challenge #12 It's a Sketch! This week, Kim Howard brings us a Fresh Sketch for Inspiration! 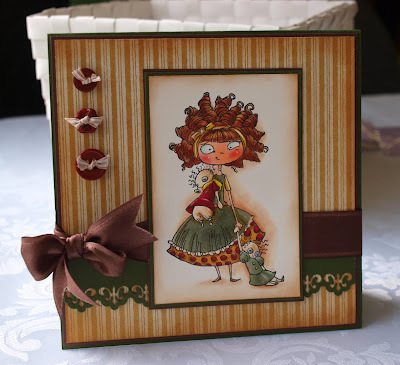 Be sure that you come back here (the Stampotique Designer Challenge Blog) to add a DIRECT LINK to your challenge card! 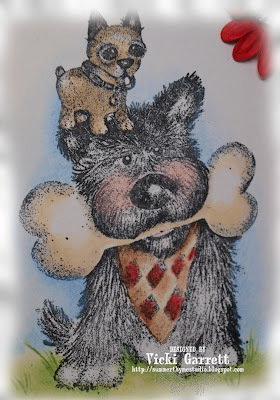 Remember, this is a Stampotique Stamps ONLY challenge this week! 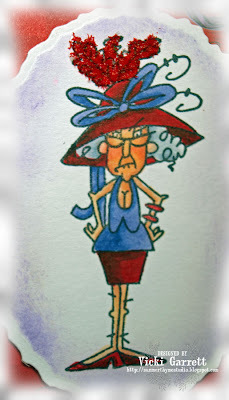 Accessories: Copic Markers, Making Memories Enamel Embellies! Over at Totally Stampalicious, we're being challenged to create a Birthday Card!!! I'm not sure about all the details of the challenge, but if you go to the TS BLOG you'll be in the know!!!! I used one of the latest releases, Cafe Scarlette. The Sentiment is from the Sweet Birthday Kids set. Hope you all enjoyed a wonderful weekend! I've used flower soft for flowers of course.....for feathers and fur, sand and snow!!! 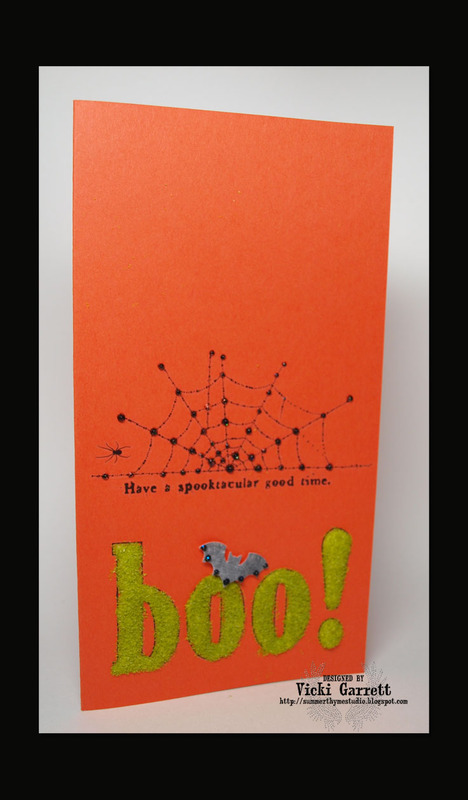 This week, I decided to use Flower Soft just to add some fun texture to this Halloween Card!!! There's absolutely no stamping required with this fun and funky card. I essentially filled in a Rub On (Boo) with Ultrafine Sage Card Soft. 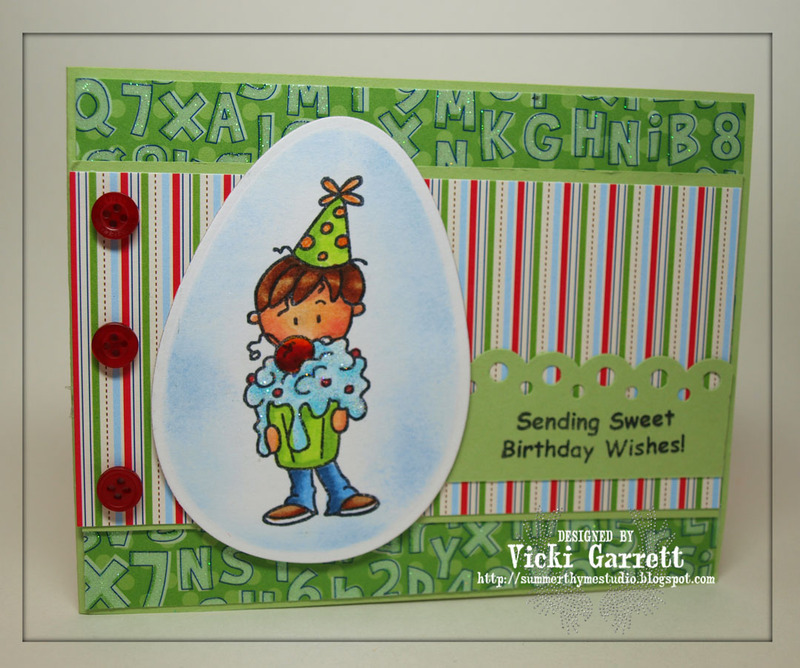 You could recreate a similar card by hand drawing the lettering, printing a large sized font onto your cardstock, or using some jumbo letter stamps. I really liked the outcome of this card. Halloween Rub On's Tangerine Tango Cardstock - Stampin' Up! 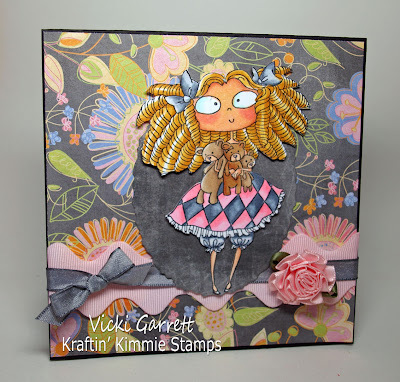 First Annual Krafty Day with Kraftin’ Kimmie Stamps!! - join us for a whole day of Krafty fun!! 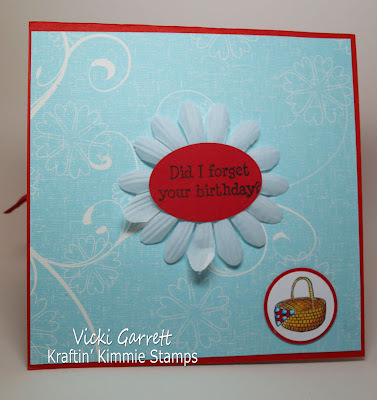 -each participant will receive an exclusive Kraftin’ Kimmie Stamps Tote Bag filled with stampin’ goodies! - a special edition Kraftin’ Kimmie Stamp to commemorate the occasion! - a lovely catered lunch, snacks and refreshments! - make and takes, demonstrations, etc. - meet some of the Krafty Girls Design Team!! - enjoy lots of kroppin’ and kraftin’ space! - Scrappin’ Great Deals on site for all your Copic needs! 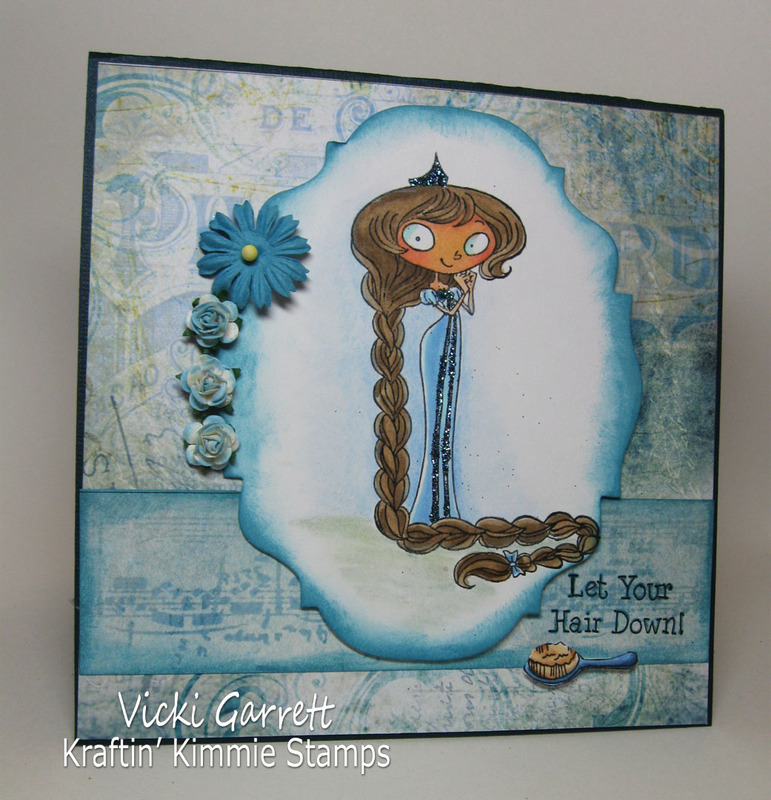 - And of course, lots of Kraftin’ Kimmie Stamps on hand for all your stampin’ needs! I sure hope you'll be able to make it!!!! Kraftin' Kimmie Saturday Challenge #39 Mostly Monochromatic! This week, our ever so talented Krafty Girl Michelle challenges us to use mainly the same colour collection on our cards........... a wee splash of an alternative colour is okay, but try to keep it in the same colour family. You'll have two weeks to pull out your Kraftin' Kimmie Stamps 'cause the little lucky duck Kimmie is headed off to CHA! There won't be a challenge next week, but we'll be back on schedule upon her return. I know she's going to have a fabulous time with Andi and Jeanne and will get to meet a lot of her stamping pals face to face! I'm not heading out to CHA this summer, so to those of you that are going, travel safely and have a blast.........I'll be missing you all for sure! 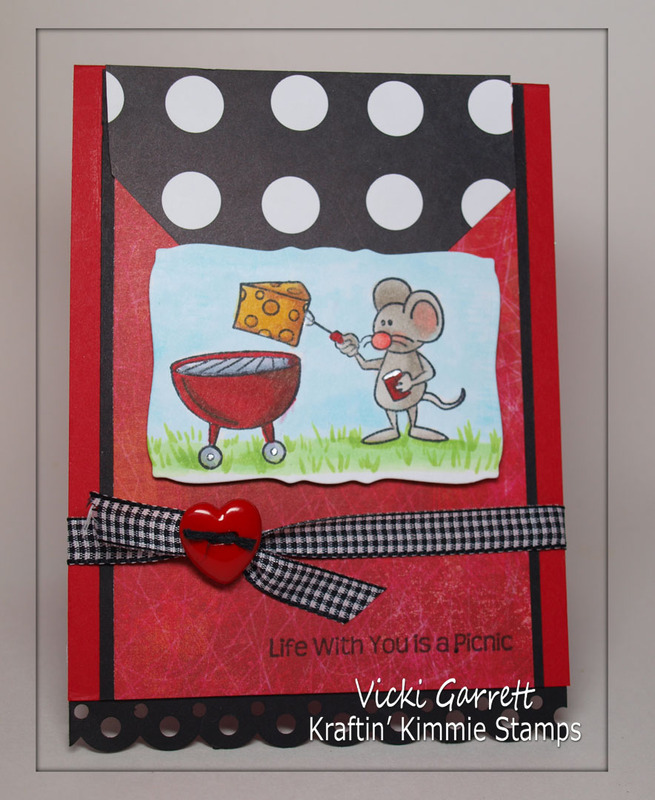 For all the details of the Challenge, hop on over to the Kraftin' Kimmie Blog! You'll get all the deets there! 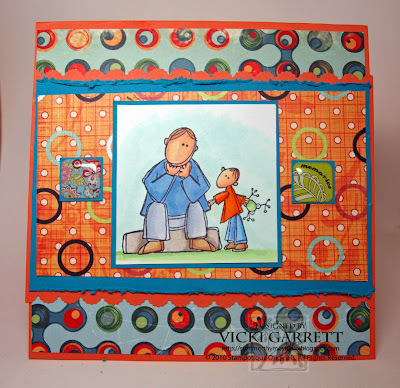 Paper Romance Challenge #8-It's a Colour Challenge! This week my Gorjuss Friend and Guest Designer Andrea has challenged us to use Chocolate, Teal and White as our Colour Combination. 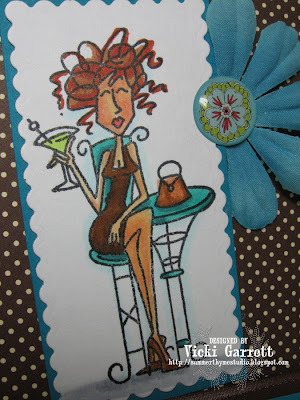 I thought that this Mimosa Umbrella Stamp would be perfect for the challenge! 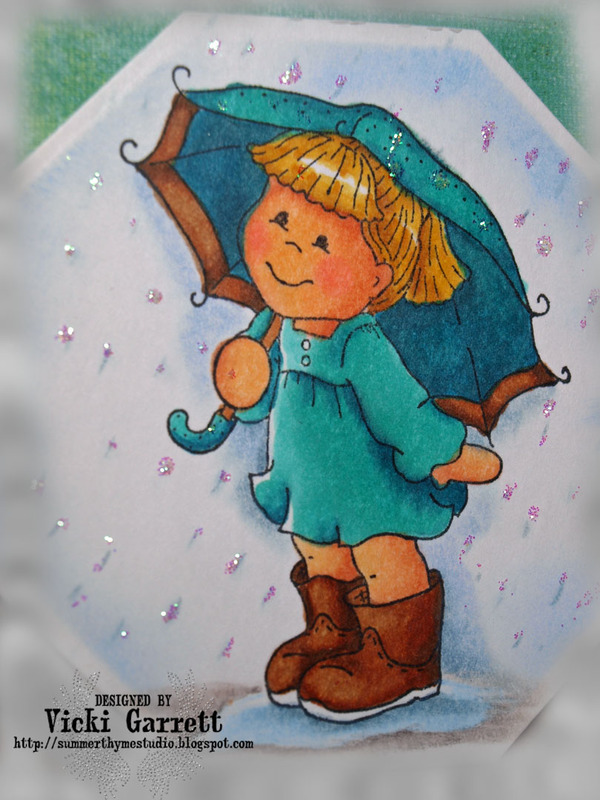 I coloured sweet Mimosa in Copics and used some Prism Pencils with Gamsol to create the Puddle, Sidewalk and Rain Drops. I cut the main image out with a Nestie and Sponged some Baby Blue Versamark ink to the inside of the Nestie. 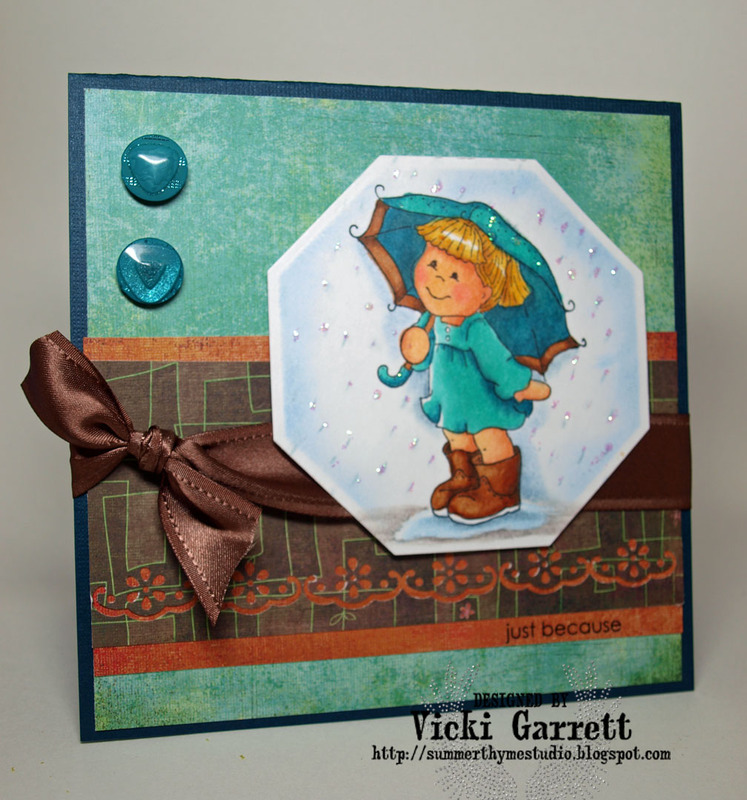 Clear Stickles accent the raindrops and the DP from Basic Grey Phoebe line matched nicely. I found a wee rub on in the drawer that fit the thin strip of Caramel coloured DP............I decided that my Chocolate would include Caramel.............Mmmmmmmm I LOVE Caramel Filled Chocolate! Want to play along? 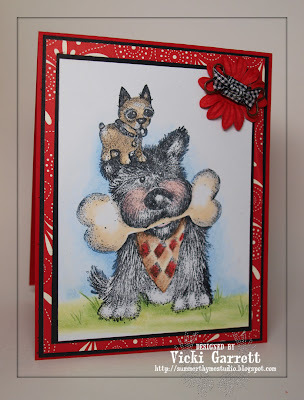 Be sure to get all the details and link your card up to the Paper Romance Challenge Blog. One Player will be chosen randomly to receive a $5.00 Gift Certificate to her Fabby Online Store!!!! This week's challenge is to use polka dots somewhere on your card. Please feel free to play along with us! For my card, I used Fly A Kite Paper by October Afternoon (Ice Cream and Picnic Table) I used the Love2Hug stamp set . This was such a SUPER quick card! I sponged the edges of the corners with Caramel ink and added a wee BoBunny Flower and Misc button to finish it off. In addition, I used a deckled oval nestie, sponging the inside with a little caramel ink and an EK success Border Punch on the Dotted Spotted STrip! Hope you have a fabby day~! 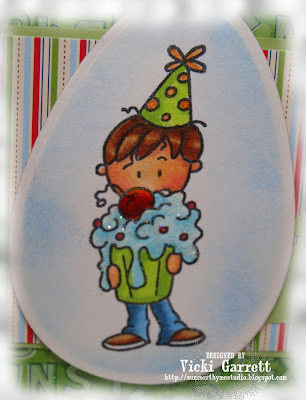 Kraftin' Kimmie's Krafty July Blog Hop! If You've already been Hopping, you've just come from Annie's Blog ........Annie is one of my favourite illustrator's EVER, so it's a THRILL to follow her!!! For my card, I used BBQ Max!!!! He's grilling up a delicious hunk of Swiss!!! Can you say Yummy???? I kept my card relatively simple today..........coloured with Copics! 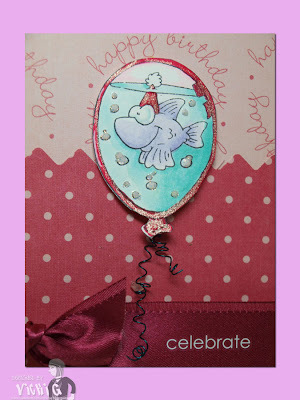 The sentiment if from the Fun Sentiments Sets, that you can find HERE on Kimmie's Site! Happy Hopping and Good Luck with the Prizes!!! Now hop away and see what Kellie has to show you! I KNOW it's going to be scrumptious! 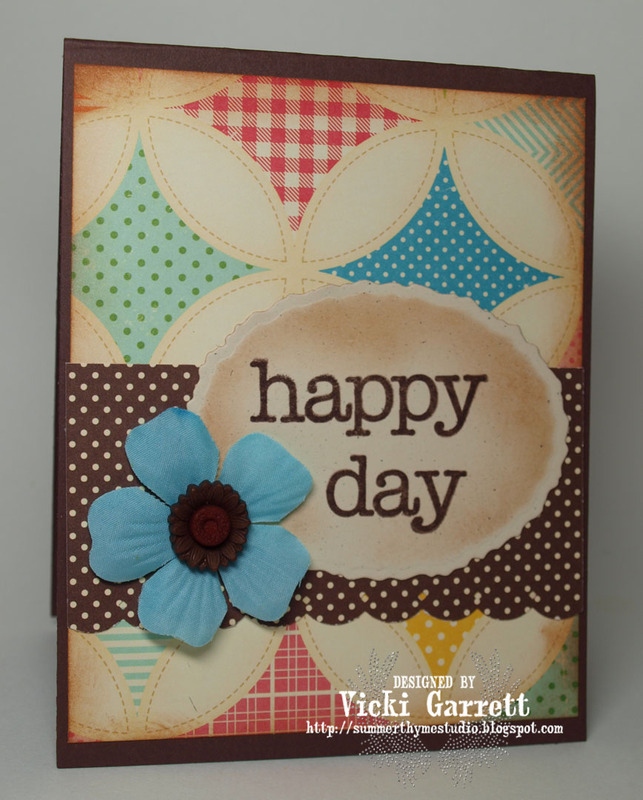 If you'd like to see the blog hop list in it's entirety, head over to Kraftin' Kimmie's blog!! More Sweet Fairy Tale Previews for you today! Are you LOVIN" this months release??? I know that I am!!!! 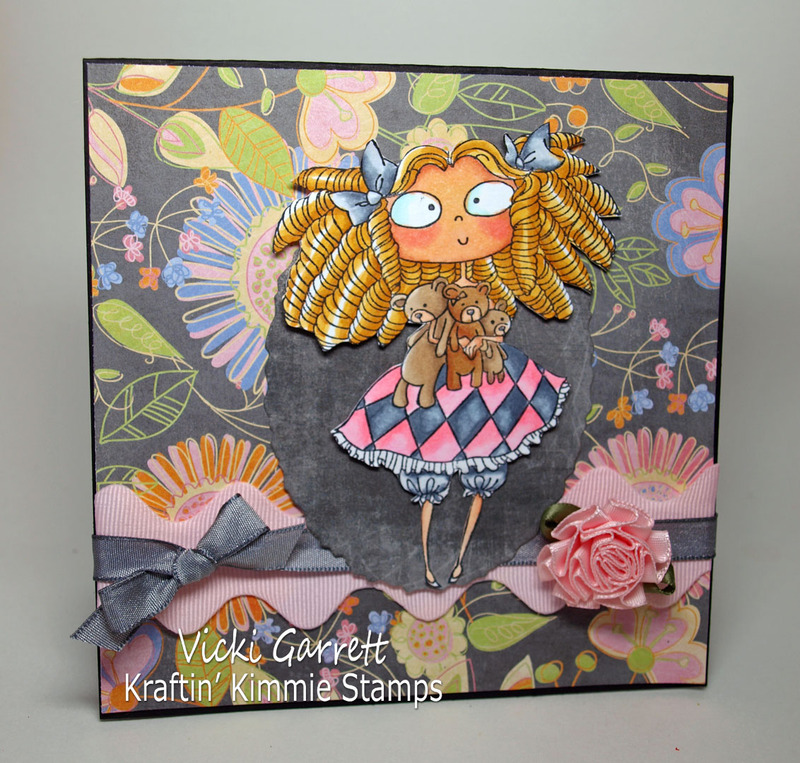 Krafty Guest Designer Krista has challenged us to use some Bows on our Projects today!!!! Just by using Goldilocks.......who will be available on Sunday at Kraftin' Kimmie Stamps met the challenge........but if you know me, not too many of my projects are without ribbon!!! 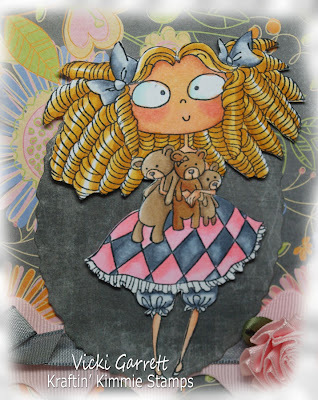 I coloured Goldilocks with Copics..........for her Hair I used Buttercup Yellow and Yellow Ochre......try to stay away from the bright yellows when creating hair unless you want to achieve the look of Fresh Lemon! Actually I prefer the E series for a ashy blonde look......but I wanted Goldi to be.........Goldish, thus the Buttercup and Ochre! Dp is from Basic Grey Sugar Rush Line.................Ribbon is Misc. Hope you'll play along with the challenge! Make sure you link your Kraftin' Kimmie Creation up to the KK Challenge Blog and you can win the image that Krista is playing with this week! Happy Stamping and don't forget to join the Krafty Girls for a Big Hop tomorrow! 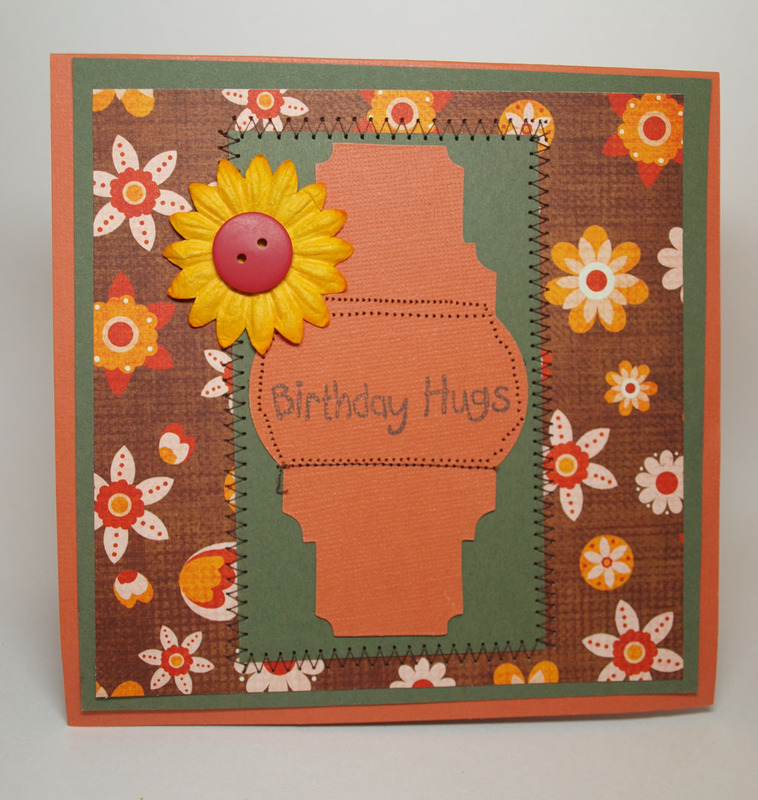 This week our challenge is to use beaucoup de buttons on your card!!! 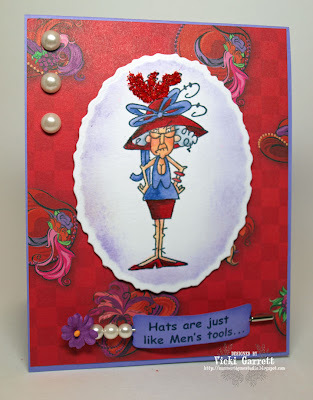 This image, A Mae Day from our Sponsor, Some Odd Girl Stamps was just perfect for our challenge!!!! 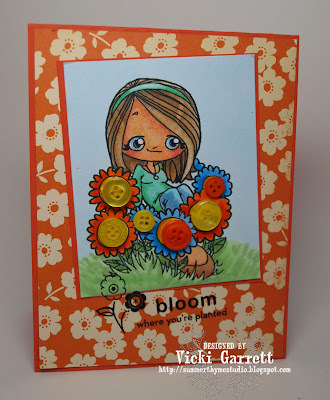 I stamped and coloured her with Copic Markers and layered her onto this complimentary paper from October Afternoon (Fly a Kite: Picnic Table) .............I added some buttons and then to complete this quick card a Rub on.......... I'm still feeling a little lazy from my surgery, so I feel like my mojo isn't at it's best! Want to play along??? Make sure you link your creation to the Crazy 4 Challenges Blog. 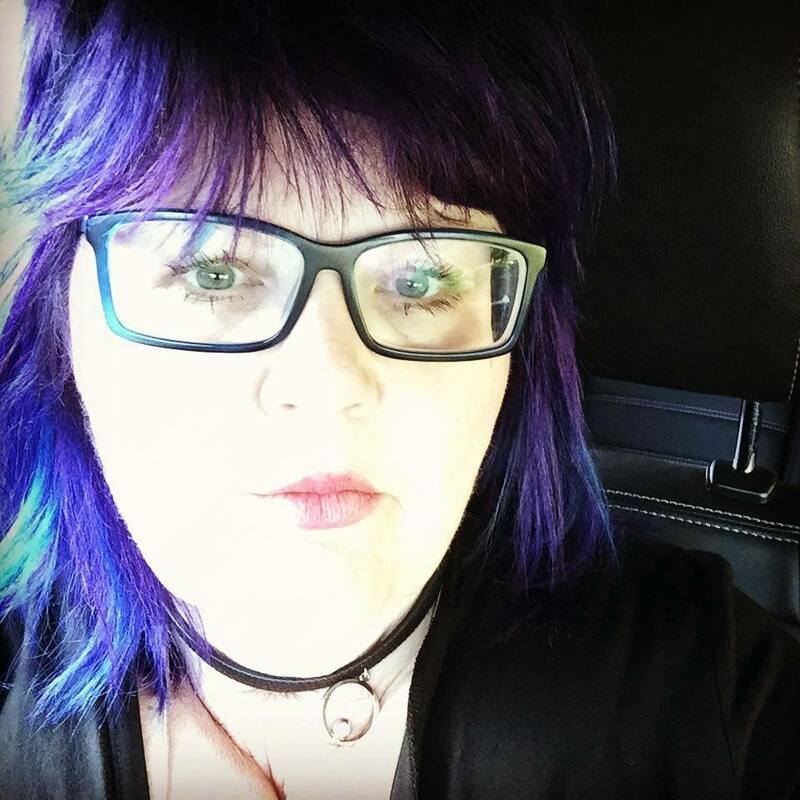 Don't forget to follow the links on my sidebar to leave some love for my fellow Crazies!!! I found some time to Play today! 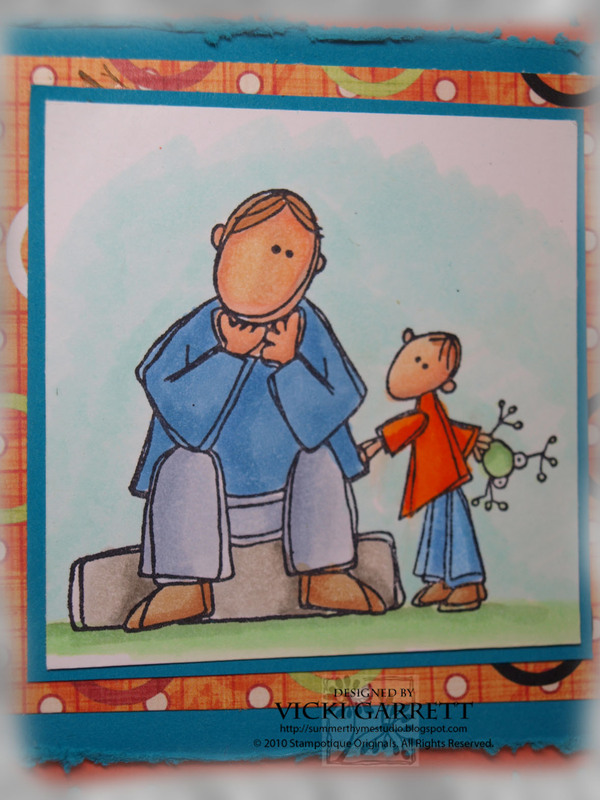 Impression Obsession has a great challenge going on this week! You can read about it HERE. I used Big and Little Dogs for my entry!!! How cute is this pair???? I really wanted to focus on the Beautiful image, so I create a Quarter Fold Card. I coloured the image using a combination of Prism Pencils and Copic Markers. The DP matches the card well, but is ANCIENT.............lol.............I think it's SU from several years ago. I found some little Dog Bone Paper Clips and Wrapped some Black Gingham Ribbon around, creating a little bow..... It seemed a little bare, so I mounted it onto a Prima Flower to give it a little oomph! Impression Obsession holds two Challenges per month, on the 1st and 3rd Thursday.....you should really check it out! You can win some fabulous Prizes and they have such a diversified range of stamps to suit all styles. Read all about the challenge on the Impression Obsession Blog! I'm off to the Lake for a BBQ! Sure wish I could swim.........it will be a few weeks before I can have a dip, but I'll enjoy the tranquil sunset!!!! I've always had a fascination with Fairy Tale and Fantasy Characters.......for those of you who've been following for awhile, you know that I LOVE all things Disney and the The Wizard of Oz is my favourite movie of all time! Sooooo you can imagine that I was OVER THE MOON to see these amazing images by Annie that Kimmie is releasing this month! In addition, you will see some sweet Miles and Maisie images as well! 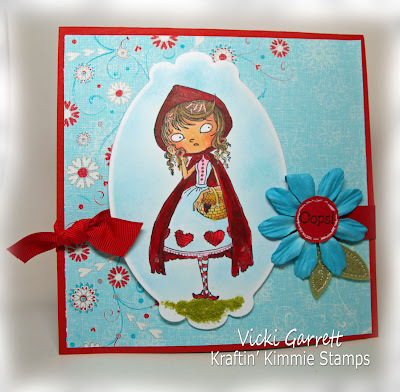 Little Red Riding Hood is a wee bit embarrassed that she forgot a Birthday as you can see in the blush of her cheeks!!!! I absolutely ADORE the wee Picnic Basket that comes as an accessory stamp! Little Red and all the rest of the July Release will be available to you this Sunday! Watch the DT Blogs for peeks through Sunday and don't forget to Hop on Sunday for a chance to win some of the new release images! 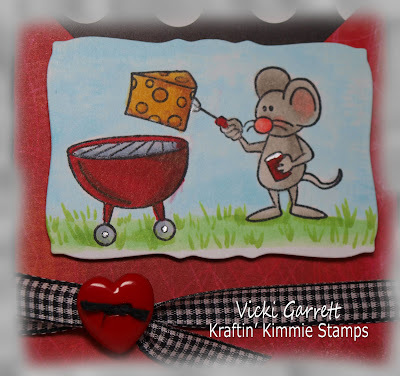 For Full Details, be sure to check out the Kraftin' Kimmie Blog!!! Totally Stamplicious Release and Blog Hop! 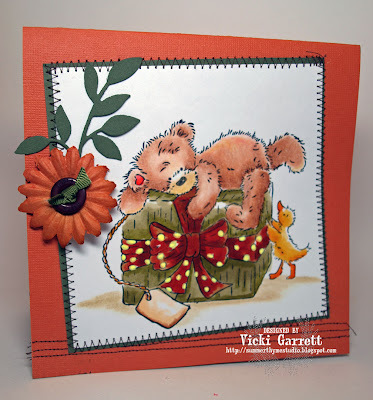 It's time for another NEW RELEASE from Totally Stampalicious and we are soooo EXCITED to share ANOTHER FOUR NEW BUGABOO Stamp Sets!! What better way to celebrate this exciting new release than with a FABULOUS and FUN BLOG HOP!? The only thing that could make it even MORE FUN is to add some PRIZES to the mix!! As usual, we will select THREE winners randomly from THREE randomly selected DT blogs so be sure to comment on all of them to increase your chances to win!! If you've been Hopping Already, you've just arrived from Stacy's blog! Today I'm sharing two samples for you! 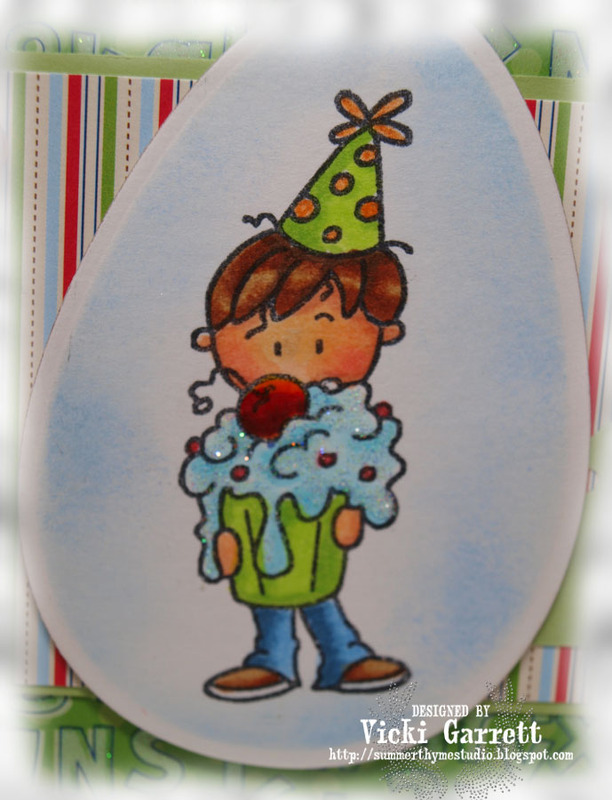 The first is the sweet little boy stamp from the Sweet Birthday Kids Stamp Set. Isn't he darling? 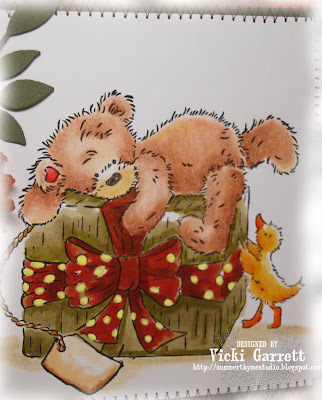 I stamped this cute little fellow and coloured him in with Copics...........I have to tell you that I lost the cover for the DP, but I believe it was a DCWV Animal Stack. I cut out the image with my Egg Nesties and Sponged around with a Baby Blue Ink. A couple of Buttons and Viola, my Birthday Boy Card was complete!!!! The DP is some older paper that I purchased in a RED HAT stack from K&C0. Hope you enjoy my samples and good luck on winning some swag!!!! Now it's time to head on over to Joycelyn's Blog to see what she has in store for your inspiration! If you'd like to find the hop list in it's entirety, head on over to the TS Blog! Paper Romance Challenge #7-Stitch it! 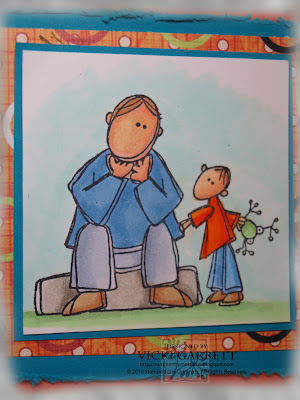 For my challenge card, I used Popcorn Bear-Birthday Hugs. I coloured Popcorn in with Prism Pencils, blending with Gamsol. For the rest of the image, I used Copic Markers....... I really like how you can combine both!!!! I made a straight stitched border on my main panel and zigged and zagged my way around the main image! I used Sizzlet Leaves.......it's about time I used the darned Sizzlet, I've only had it for three years! !lol and a CTMH FLower topped with a misc Button. I even got stitchy with it on the inside of the card! 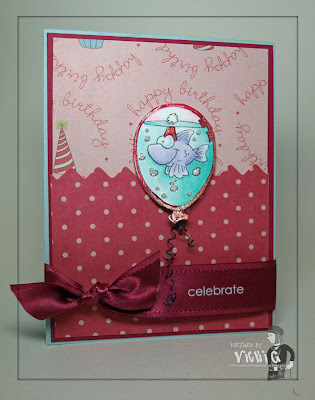 DP on the interior is from Bo Bunny Press and a nice sized remnant that I found in my scrap stash! 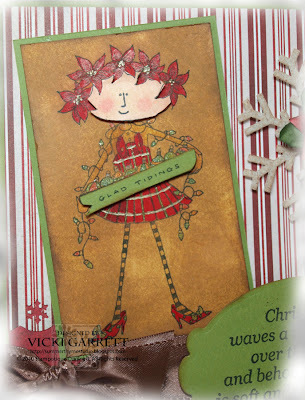 It's beginning to look a lot like Christmas over at the Stampotique Designer Challenge Blog!! 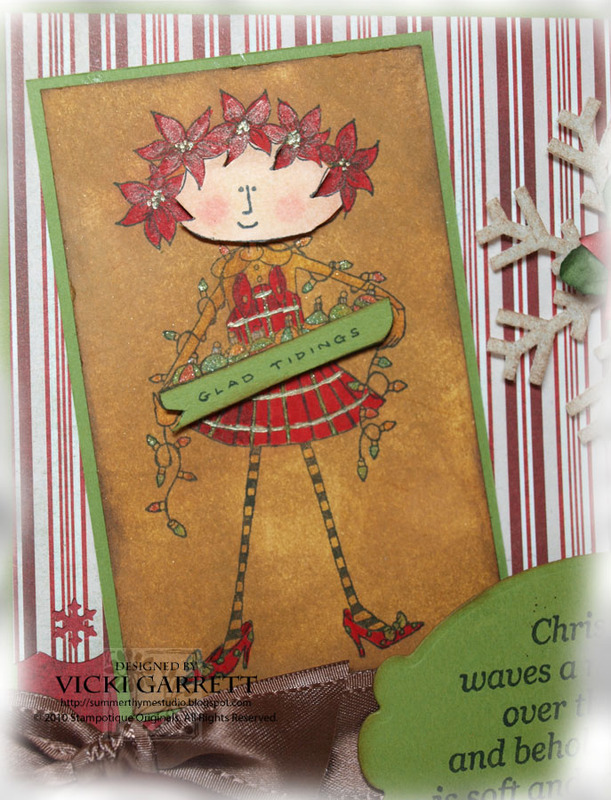 This time around we challenge you to use your favourite Christmas Stamps to create a card. You can find the full details of the challenge over at the SDC Blog. I coloured Poinsettia in Copics and then I ran Brushed Corduroy ink over the whole image..........since that made her face WAY too dark, I restamped her face and coloured, cutting out the face portion and mounting in on a dimensional. I then got the brainwave to stamp the sentiment on her image in green and pop that off the image as well. The DP is from the Basic Grey Figgy Collection. Brads are from the Dollar Store and Pointsettia flowers are misc! Hope you'll play along. 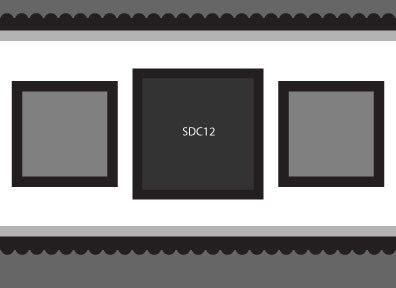 Be sure to link up your sample to the SDC Blog! 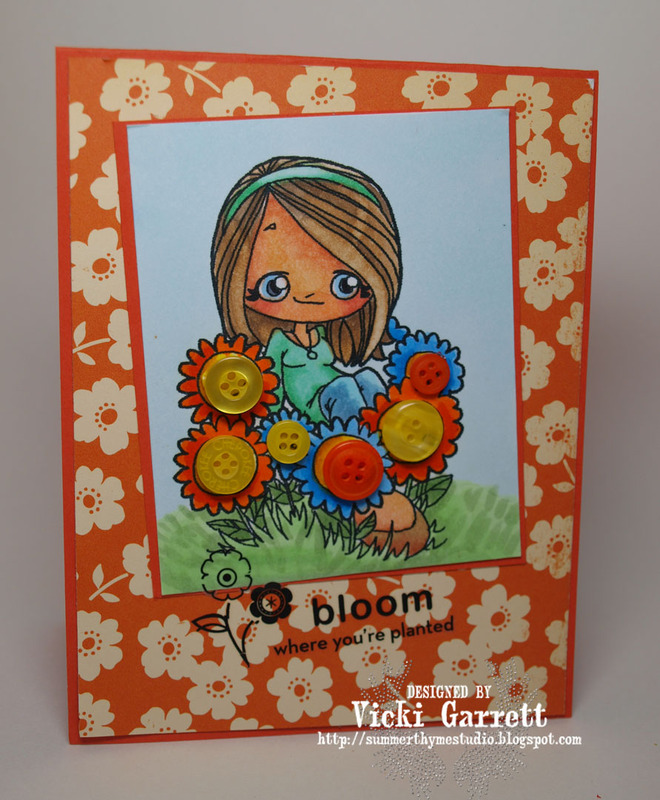 Flower Soft Launches new Toppers today!